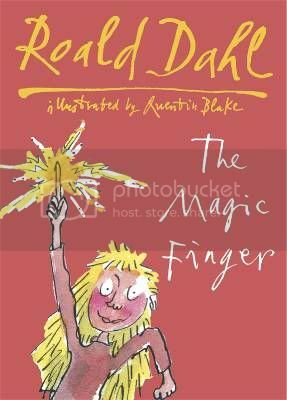 It's Roald Dahl Day today, and though I don't normally review children's books, I thought I would celebrate the writings of such a brilliant author by reviewing one of his books I loved as a child. I was never much of a reader when I was a child. I didn't like it, I found it boring. I only discovered my love for reading as a teen, but as you all know, reading is required while at school. So I read whatever I was given to read grudgingly - that is until I discovered Fantastic Mr Fox and The Magic Finger by Roald Dahl. Those two books I could read over and over. I remember I even spent some of my free class play time listening to the audio book of The Magic Finger on the casette player. There was something just so wonderful about this story that kept me coming back again and again. Now I've read it again as an adult, and the story of a family of hunters who grow wings after the little girl puts her magic finger upon them is just charming. It would be exciting and funny for the children, and the adults will enjoy seeing their children react to it. It's just such a great story! I think it's brilliant how it's written. Right from the first page you can tell how brilliant Roald Dahl is at getting into a child's head; we find out the narrator is a girl, and the things she thinks are imporant for the reader to know; who her friends are, that they are boys and how old they are. A typical child introduction that is just perfect. What I also think is interesting is that we're never given the narrator's name. She's telling the story about what happened to the Gregg family, and though she played a part in it, it's not her story. The language is simple enough for a child to understand, but yet still written in a way an adult can enjoy when reading with/to a child. It is also brilliantly written for an adult to read outloud to a child; use of italics and exclaimation marks making it clear when the adult should be using a humourous tone. And as always, the book is fantastically illustrated by Quentin Blake. Dahl's books would not be the same without Blake's illustrations. Simple but just brilliant, they are the icing on the cake of The Magic Finger; the girl and her magic finger, the Greggs with wings, and the ducks with arms, acting like humans; cooking, playing, on the phone. As an adult, I love them, but a child would find them so funny! Of course, The Magic Finger would be great anyway, but Blake's illustrations make them the full package. This edition of the book hs a lot of goodies in the last pages, including quotes from Dahl, his favourite things, a timeline of important events in his life, and more! It's really quite interesting! I will leave you with a quote that made me giggle. Who wouldn't laugh at that? Find out more and what you can do to celebrate on the Roald Dahl Day Website. I adored Roald Dahl as a child, but I never read this one. I think I need to rectify that! Ohhh, it's such a great book! But there are a fair few I haven't read; both Charlie's, Danny, too many! Lol. I've never read this one! Now, I'll have to go find it. I loved Fantastic Mr. Fox as a child -- and recently posted about it on my own blog (having a little Dahlathon this month). I was thinking of writing a review of Matilda yesterday, but ran out of time. I haven't read most Roald Dahl books, I really should get around to it! I did like Matilda! It was a great book! I'm the same, there are so many I haven't read, lol. His books are pretty awesome!